With a 40kt easterly wind forecast by the Met Office and WeatherPro showing gusts of over 27 kts by 1100 it was very quickly decided that today would be a ‘no fly’ day. Perhaps too quick for some, since, by mid-morning the wind remained light and variable – and there was a definite temptation to ignore the forecast and get the toys out. 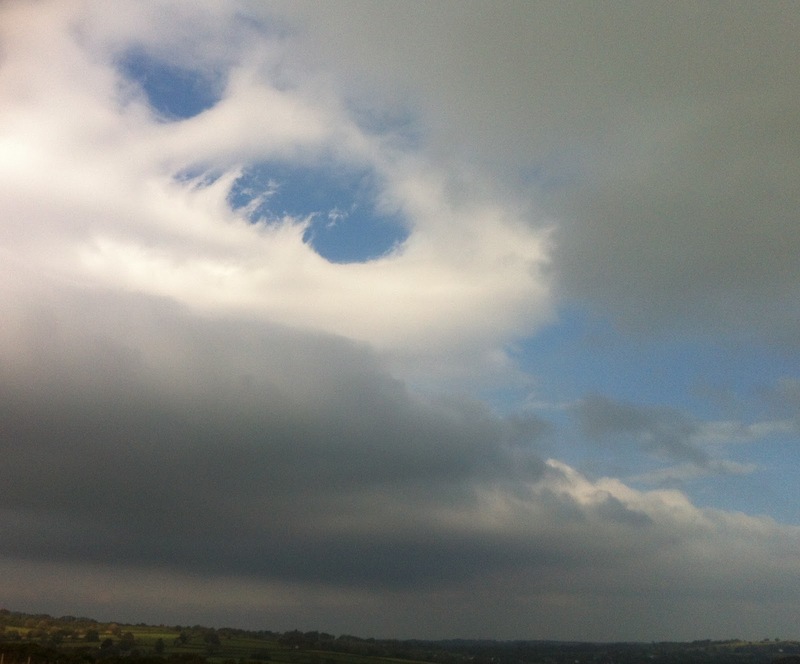 The roll cloud was clearly in evidence over the moor today – but would there be wave? However by then we had already disappeared down a very deep rabbit hole entitled: ‘How Many Glider Pilots does it Take to Change a Lightbulb?’ The mission was simple: fit a new amber flashing light to the new blue winch. The answer: not so simple, as the light – which shone and whizzed when connected to a battery, stubbornly refused to light or spin when connected to the winch electrics. How can that be? Well, those who understand wiggly amps will say of course it was a project doomed to failure since the light was 12V and the winch 24V – the bulb would simply burnout (actually it was us who suffered the burn out) but not so, the winch has a voltmeter which reads 12V so clearly it had a 12V supply we could tap into… Result? Nothing! 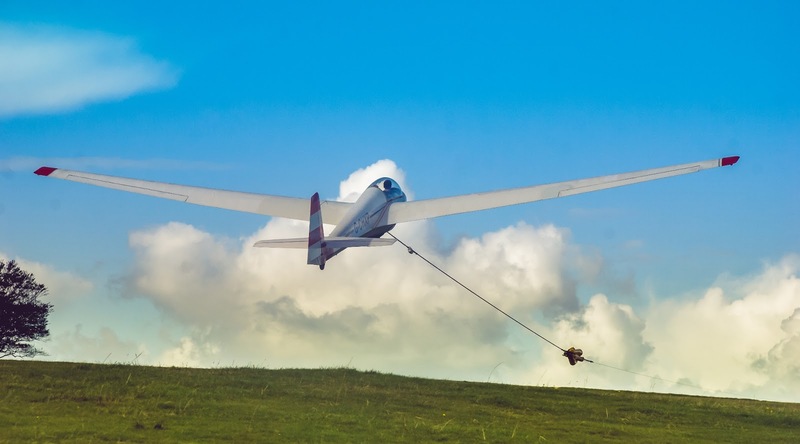 How many glider pilots does it take to change a light bulb? 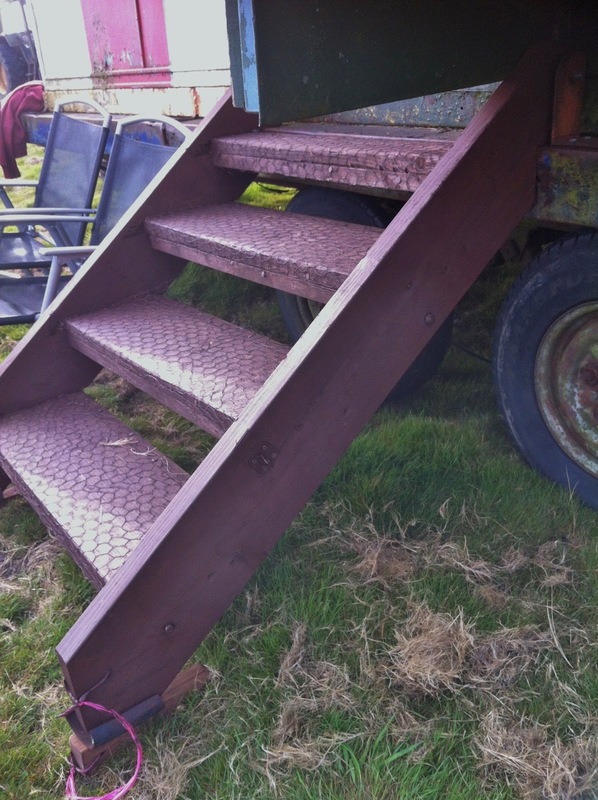 Looks like 6 – but could they get it to work? On a lighter (ho, ho) note, mention must be made of the very positive contribution that has been made by the Acton family this week. Taking advantage of the rain we experienced early in the week Chris, and son Henry, have been using the small tractor and rotorvator type device to spike the entire airfield, which should have a very beneficial effect on drainage as winter approaches. 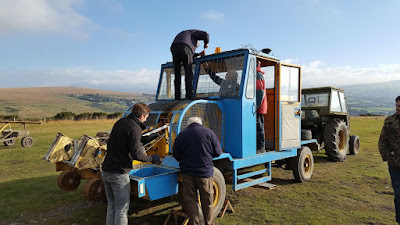 They’ve also taken the front (punctured) tyre of the big tractor off for repair so we have even more reason to say: Thanks, guys. Fancy a flight in the washing machine? Evidence that the airfield was in the middle of rotor. But back to the amber flasher: with lunch approaching and the thing refusing to obey the laws of electrical science (including the efforts of aging rock lightshow star Colin Boyd), an alternative approach was clearly needed. Rooting around in what is euphemistically known as the garden store, Colin found two or three old amber flashers he thought might be made to work. Indeed, when fitted with a 24V bulb, one worked a treat! So maybe if we’d fitted a 24V lamp from the start..? 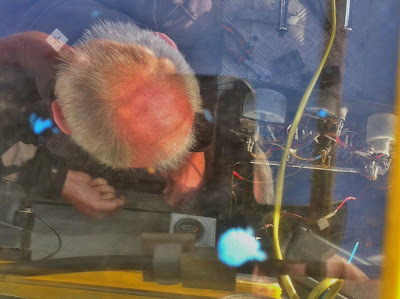 Roger wires the light into the 12V supply of the winch. 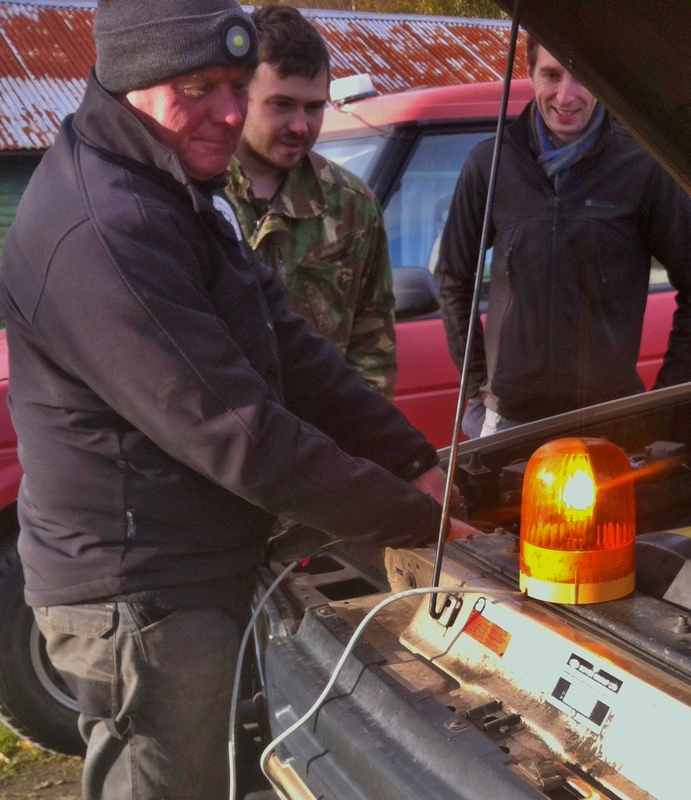 Roger checks out the amber flasher before taking it up to the airfield. Next Sunday’s weather is also forecast to be easterly – but not nearly so strong and so, although the wind speed/height profile isn’t available yet, it should be much more clement. Don’t forget to turn your clocks back!! Today was a club flying day for licensed pilots and the wind direction lured several to the airfield to fly. 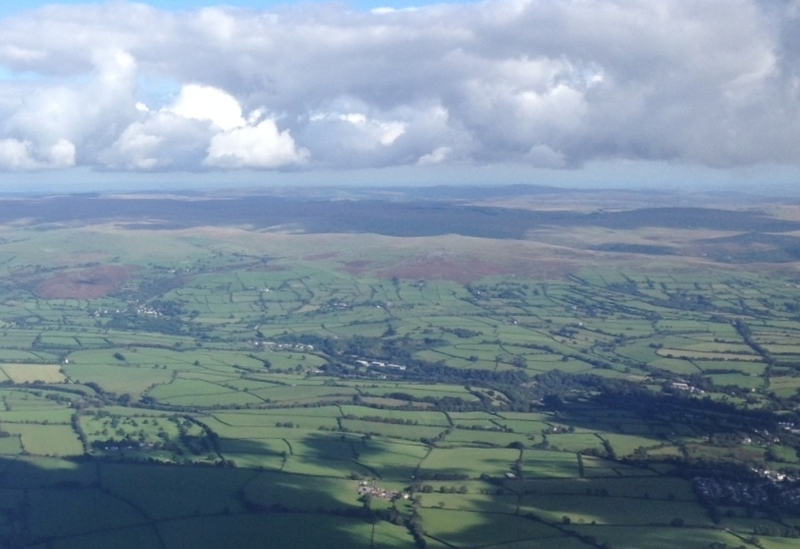 Initially conditions looked good with a cap cloud firmly positioned over the higher tors to the east. However, first flights revealed that there was no wave to be found but the sky was alive with rotor turbulence making flying conditions uncomfortable to say the least. With care conditions were soarable in the rotor. This was not improved later when some thermal activity added it's disturbance to the already "lively" conditions. We welcomed a couple of visitors today. 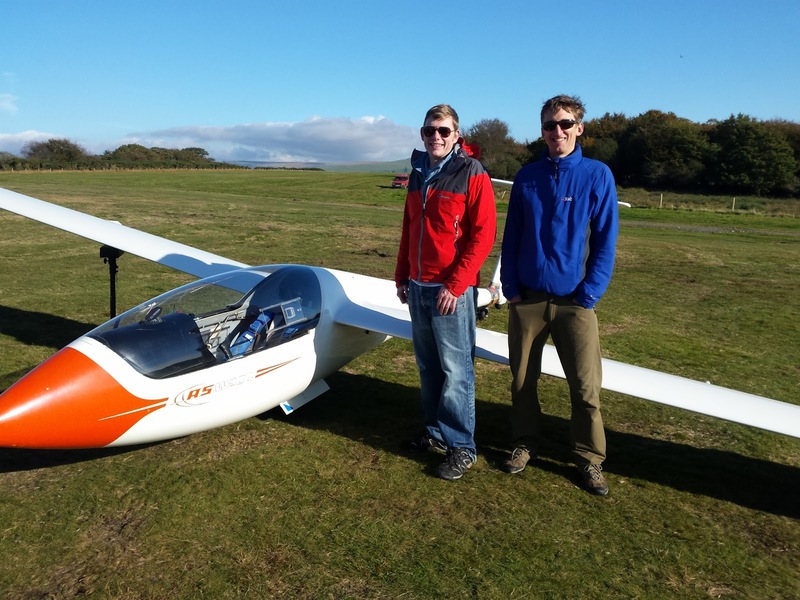 Matthew Williamson arrived with an ASW20 and his fellow club mate Tim Peters to join in the fun. 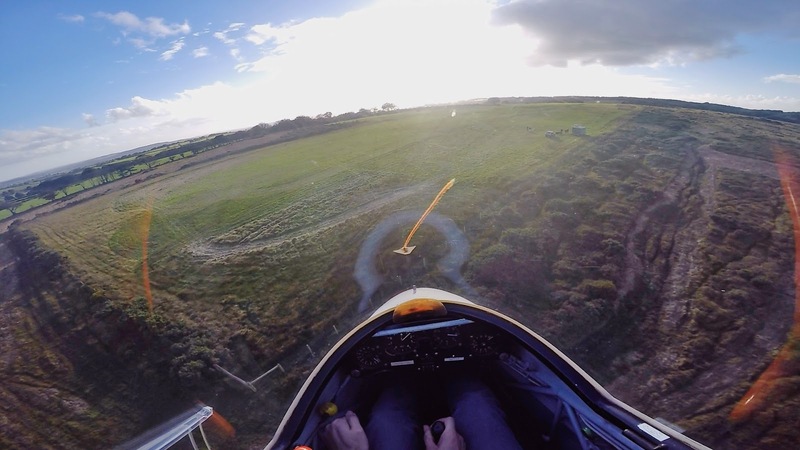 Matthew had the best flight of the day spending 2 hours 15 minutes soaring in the turbulent conditions until he could stand it no longer and nade a swift airbrake decent to the airfield. Great effort Matthew. Everone who wanted to fly did so before the strengthening winds and increasing gusts sent us back to the safety of the hangar. The workshop ready to receive a new set of wings. 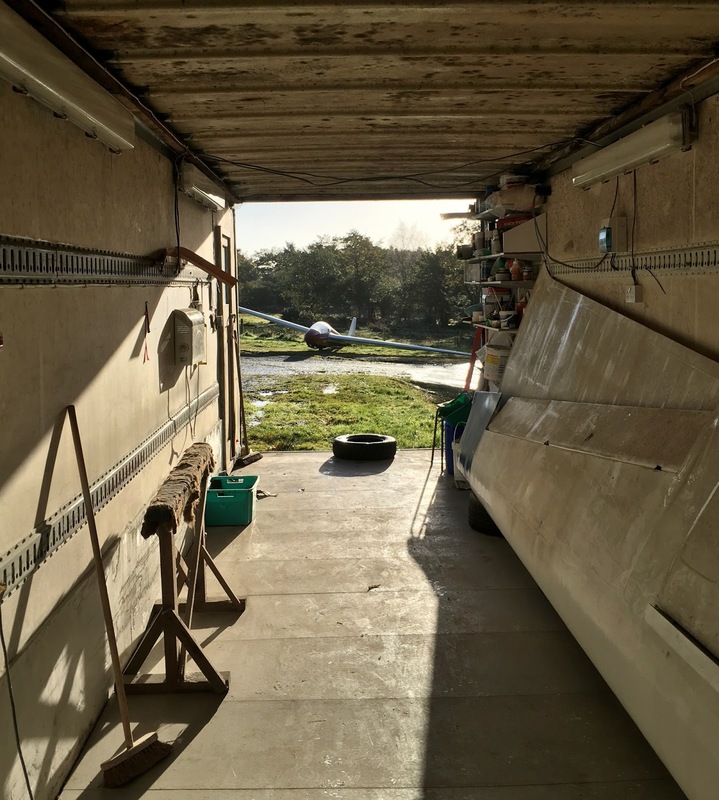 First job of the day, however, was to lift and shift wings from the hangar to the workshop and vice versa, for which many hands did indeed make light work, and was accomplished (without argument or injury) inside 20 minutes. Then, being a Sunday, and as declared by Heather Horswill, it was window cleaning day, including the launchpoint, where Heather requested a long pole to give the necessary reach. Well, we couldn’t find one and so we provided Ed Borlase, who seemed a perfectly adequate substitute..! With these tasks completed, ends changed and Roger Appleboom teamed up with One Day Course student Russell Weston, we could start flying. After the first couple of launches the call came from the winch: “Can pilots please lay off properly to the South?” a message which didn’t need relaying from the launchpoint radio, you could hear the emphasis in Barry Green’s tone from the cockpit… The wind at that point was S’ly 7kts, gusting 15. One Day Course student Russell Weston, from Plympton, with Roger Appleboom. First on the club trainee list was Dave Downton who, after a couple of launches (and near perfect recoveries) was asked “you’ve got to lay off even more”, (well, that was hardly a question). It would appear that the wind was freshening. 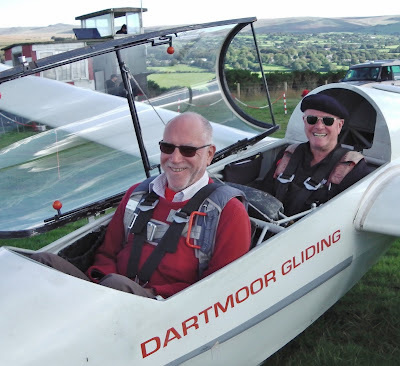 Roger flew our 1200 visitor Jonathan Pugh whilst Dave made way for Ed Borlase in the other K-13. At which point we noticed the wing tip holder was having difficulty in keeping the wing down. 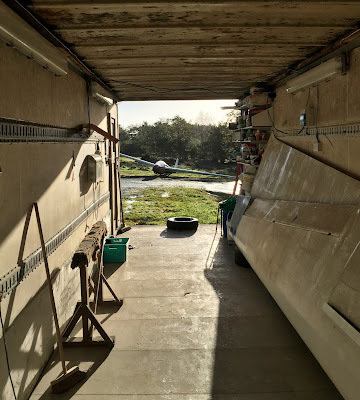 On return from Ed’s first flight I couldn’t find a tyre to put on the wing because they’d all been press-ganged into providing gravitational assistance for the K-8, and then couldn’t find a wing tip holder because they’d all taken shelter behind the launch hut. Something, slowly, was beginning to form in my Holmesian-like brain. 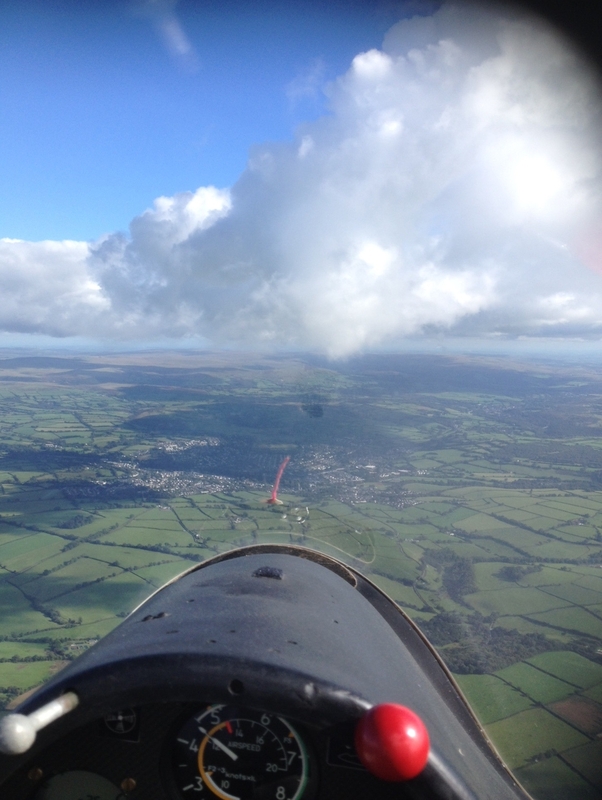 Dave Downton turns onto final approach in K-13 G-DDMX. 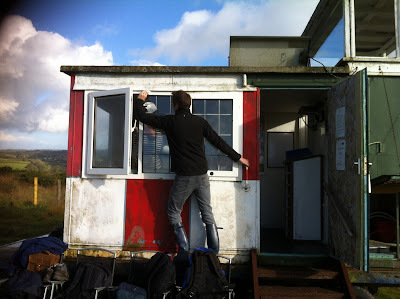 As we prepared for Ed’s third launch Steve Fletcher came across declaring that he had to “get out of the launchpoint because that alarm on the weather station is going off continually and it’s not good for my tinnitus..!” The windsock was, by now, horizontal more than it wasn’t. We then received a message that the cable had gone well over the fence and it would be 20 minutes before it could be recovered. That was when, subliminally, the penny finally fell into the tiny decision making slot of my brain. We had to stop. Getting the gliders back provided an unexpected source of amusement as the ‘ballast’ occupying the cockpit of the K-8 attempted to change direction using the rudder pedals whilst the glider was being towed by the Range Rover Discovery! Totalling only ten launches only today (which was a shame since the 60kt final turns and approaches were more like riding a motorbike on a track day than the usual plod around the corner) sincere thanks must be paid to the long suffering winch/retrieve team of Barry Green and Heather Horswill: and yes, the message did get through – eventually! That took us to a late lunch where we were able to enjoy not only the company of Allan Holland, Dave Bourchier, Chris Owen and Pete Harvey, but also indulge in some delicious ginger cake provided by Pete’s partner, Jules. Thanks, Jules. So what is the crosswind limit for the K-13? Well, we can’t tell you, because we didn’t find it: we stopped before reaching that limit, not after it. 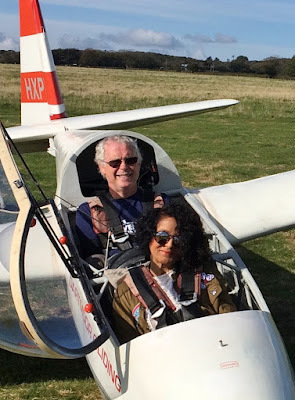 And if that sounds pompous and self-righteous well maybe it is, but at least the gliders were all returned safely to the hangar – ready to fly another day. Today we discovered that dramatic steps had been taken, and replaced, to enable us to get into the launchpoint. 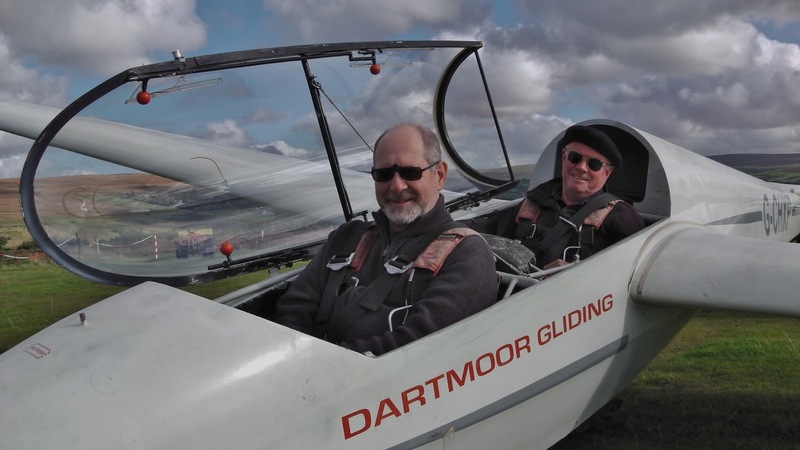 Following condemnation of the previous flight (which had been held together by a wing and a prayer over the last few months) a plea was posted on the Forum which resulted in, yes, you’ve guessed it, ‘The Voice’ of Dartmoor Dave Downton responding with his wood cleaver and drill to effect a midweek replacement of the steps (see photo). Well Done, Dave, and thank you. thanks to Dave Downton and Colin Boyd. Today was also new winch induction day. Our new blue winch (which you could be forgiven for thinking is the old one simply given a lick of paint) has some significant differences in the brake department which require each winch driver to be trained in before taking over. This lost us some time and launches today which, although inevitable, was ‘sub-optimal’ and is to be regretted. Could that be wave? The new winch is framed by a crescent or early morning cloud. But what of the weather? The forecast predicted 060 at 8-13kts and so naturally, we were all expecting to be at x,000’s of feet in wave by midday, and indeed the early cloud looked that way. 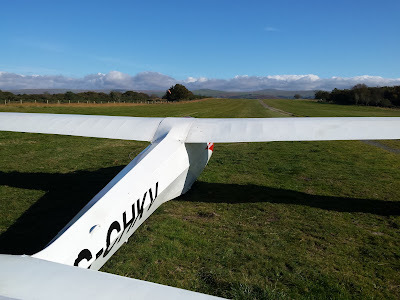 But from mid-morning it was clear that the real weather had other ideas, being generally northerly 7kts/light and variable on the surface with no change of direction but increasing in speed with height. Which eventually gave rise to… convection, classic cumulus and some superb thermals (better than August or September’s miserly offerings…) These allowed nearly all club trainees, Charlie Taylor, Dave ‘the Potter’ Westcott, Elliot Acton (22 mins with Peter Howarth) and Jeff Cragg to get some soaring, whilst Peter Howarth flew our One Day Course, Jeff Ellis, and visitors Charlotte Moraiz, Freda Welton and Jeff’s wife Liz Ellis. with Asst Cat Flying Instructor Peter Howarth. Inquisitive visitor Freda Walton (see text). 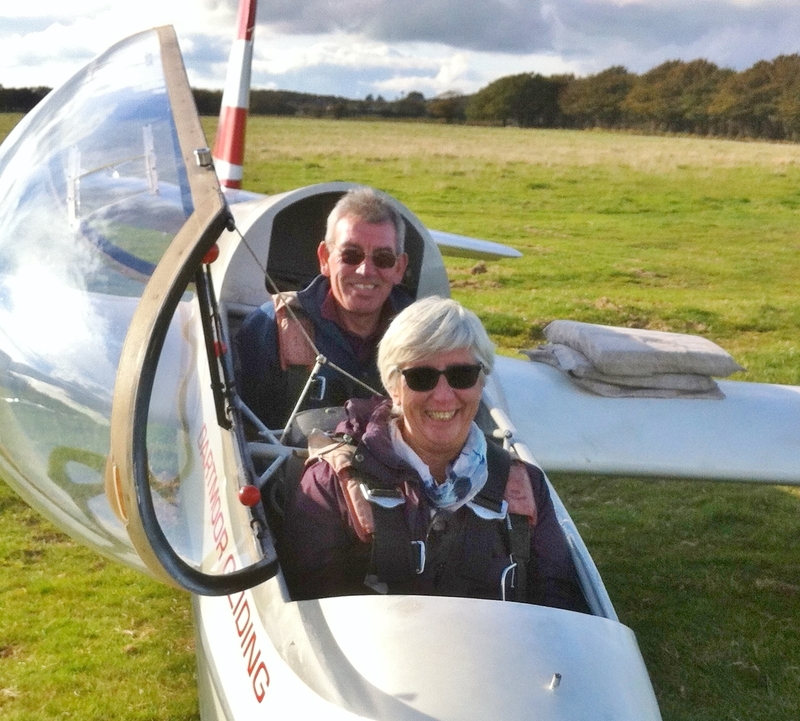 Jeff’s wife Liz, prior to her flight with Martin Cropper. 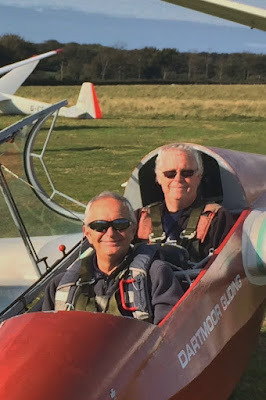 Although Flight of the Day went, by a country mile, to Roger Green in his ASW-20, mention must also be made of Roger Appleboom managing 1hr 50mins in his K-6 (see photo), Paula Howarth achieving 14 mins in the K-8, Barry Green 22 mins in the Zugvögel and Peter Howarth 15 mins on first flight in his newly acquired K-6CR. Roger, meanwhile, who headed for Cornwall, said that “initially, climbs were to 4,000 ft QFE (!) with big areas of sink in between. 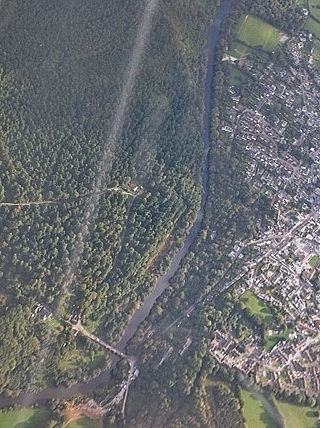 Very weak wave in late afternoon…” He also found time to take some spectacular photos, one of the Tamar which, if you trace its course from the top of the photo, shows just how steep, narrow and tortuous the valley becomes upstream, and another in which you can gloat over the queue of cars crossing the bridge at Gunnislake. Those who know the area will be able to make out the zig-zag of the A390 as it careers down to the bridge and the steep incline of Newbridge Hill that then climbs up into the village. 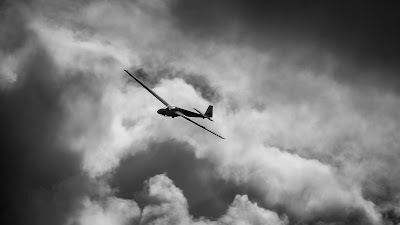 Roger Appleboom, in his K-6CR, seen soaring by Roger Green in his ASW-20. How many cars can you see crawling across the bridge to Gunnislake? Roger’s intriguing picture of Sunday afternoon traffic crossing the Tamar. 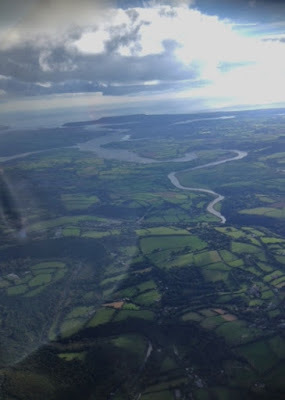 The River Tamar snakes south towards Plymouth and The Sound. 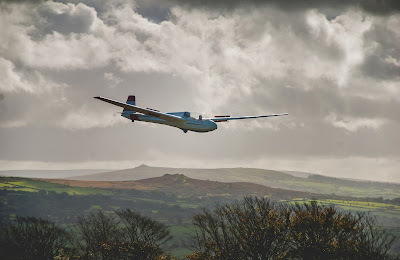 Over 38 flights took place today over the UK that were in excess of 100km (the longest being 300km, from Keevil, in North Somerset) - one of which was from Dartmoor! But more of that later. A very promising weather forecast (RASP showing 3.5 by 1:30pm) for the time of year generated an equally good turnout today, with visitors, trainees and solo/privateers aplenty. Plus the all important Acceptance Flights for our two new Asst Cat Flying Instructors, Rick Wiles and Peter Howarth. 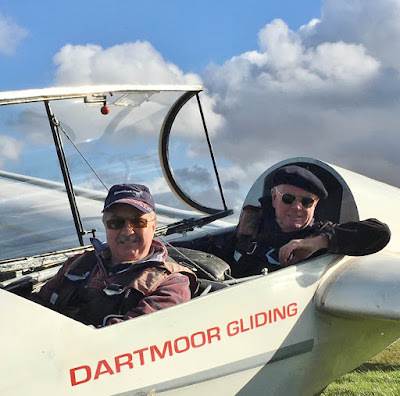 Undertaking the new modular BGA Course has been like a marathon for Rick and Pete, requiring them to give up weekends and travel to at least three other clubs in order to complete the various sections, plus ground school at Brentor, demanding a great deal of commitment and time away from home. And yet they seem to have come through with their sense of humour intact! Well Done both, and thanks also to CFI Don Puttock for leading their training. 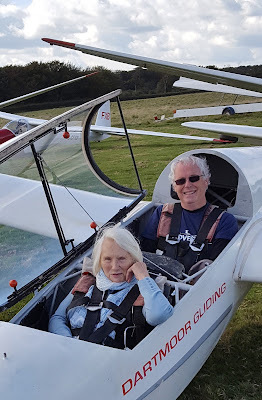 On the ground we got off to a bit of a faltering start, but it wasn't long before Duty Pilot (Don Puttock) put things right and by afternoon we managed 2 hours at 8 launches per hour, with 3 others at 6 lph and 1 at 7 lph. 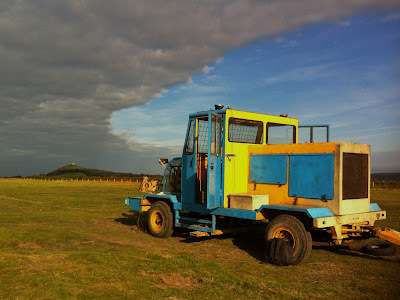 By 11am the sky was starting to look very impressive over Cornwall, and not long after the Cu began popping off over the airfield. The wind was a little disappointing, choosing to align itself much further SW than the westerly that had been forecast, however it was nothing like the Southerly near gale that blew yesterday, and did not hamper our operations. 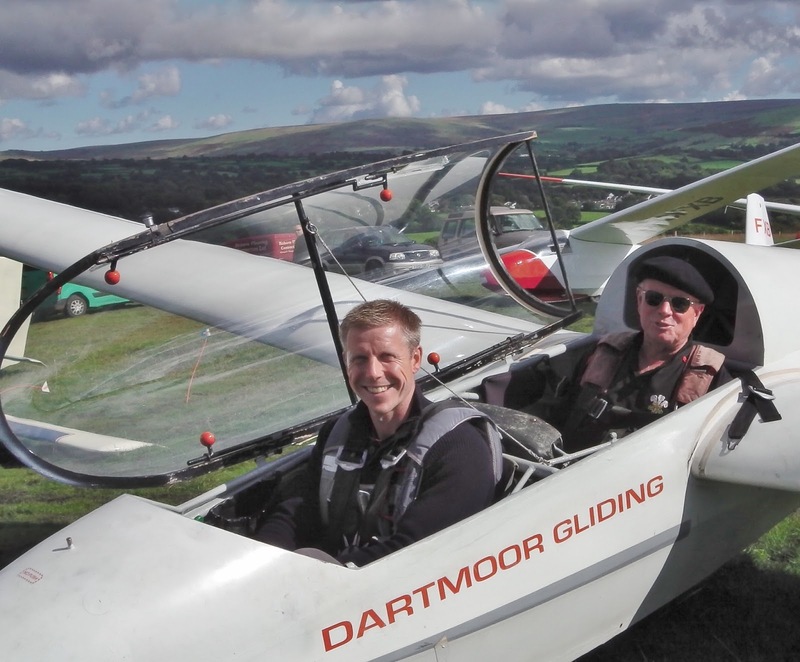 Roger Appleboom, today's intrepid IFP, flew with visitors David Gilbertson, Martin Hills, visiting photographer Roger Bacon and émigré paraglider Jan Baev, whilst shiny newly qualified Peter Howarth flew with trainees Dave Westcott and Callum Doyle and Rick Wiles flew with trainee Ed Borlase - we waste no time at Brentor! 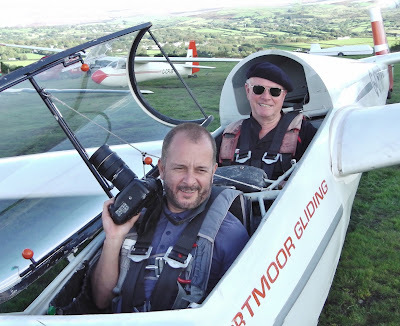 Photographer Roger Brown travelled from London to visit the club. 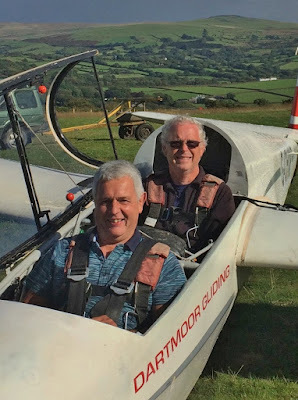 Four of our solo members managed flights in excess of 30 mins, including Barry Green (43 mins), Richard Roberts (47 mins), Robin Wilson (57 mins), and Roger Green (2hr 9 mins). Richard used the day principally to show off the sinuous lines of his new Discus 2bw (which in Schemmp-Hirth-speak means: yes, it's got "2 bloody winglets"! ), whilst Roger, in no need of such fripperies, flew a quadrangle of 110kms in his ASW-20, around Roadford Lake (reservoir), Launceston, Gunnislake, Princetown and back, spending 65% of his flight above 3,000ft amsl, and almost all of it above 2,000ft amsl (just the launch and the landing weren't...), returning to base as a convergence began to set up in late afternoon. 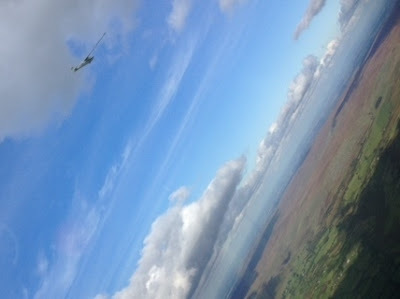 Flying N-S to the west of Dartmoor, Roger spotted a convergence zone begging to set up. another view of the convergence from Roger’s ASW-20. 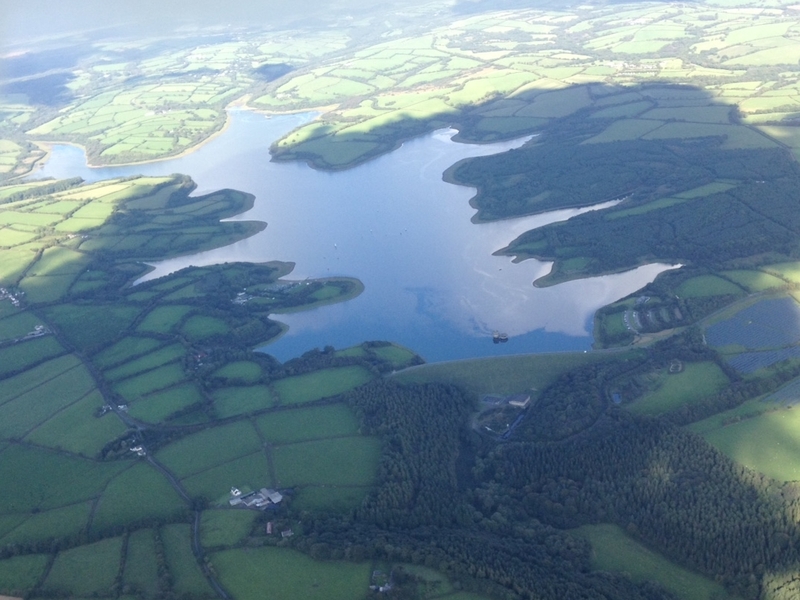 Roger Green’s view of Roadford Lake to the north of the A30. Late afternoon?? Yes, it has to be admitted that 'late afternoon' is creeping in and rapidly reducing temperatures (misting canopies) plus low angle of the sun (glare) mean we may need to start packing away (stack) before our keen, newly qualified instructors are ready to hang up their parachutes. So remember, you have a part to play in safety (whether it be advising caution or just calling "Stop, Stop, Stop"); and no one will object to us achieving less than the 53 launches that we did today, if a potential incident is avoided in doing so. Pinch yourself: are we still flying? Yes, we are..! Today exceeded all expectations. b. winds gusting from the west to over 20-25kts, we actually flew all day. Ed Borlase captured this double rainbow mid-morning. OK, well, there was a break for 30 mins whilst a shower passed through but that was nothing like the torrential downpours that afflicted others in the locality. And yes, we did send the K-8 back to the stables because the wind freshened and crossed on the runway sufficient for us to be concerned, but otherwise conditions did not become as threatening as the forecast predicted. K-13 G-CHXP rotates in to the climb. And so it was that IFP (soon to become fully fledged Flying Instructor) Peter Howarth was able to fly all our voucher visitors: Charlie Blanchard, the amazingly light (so light that they had to fly in the back seat of the K-13) and polite family of Josh Lai, Mia Burgon and Louis Costello and Chris Greatrex. Visitor Chris Greatrex about to fly with Peter Howarth. 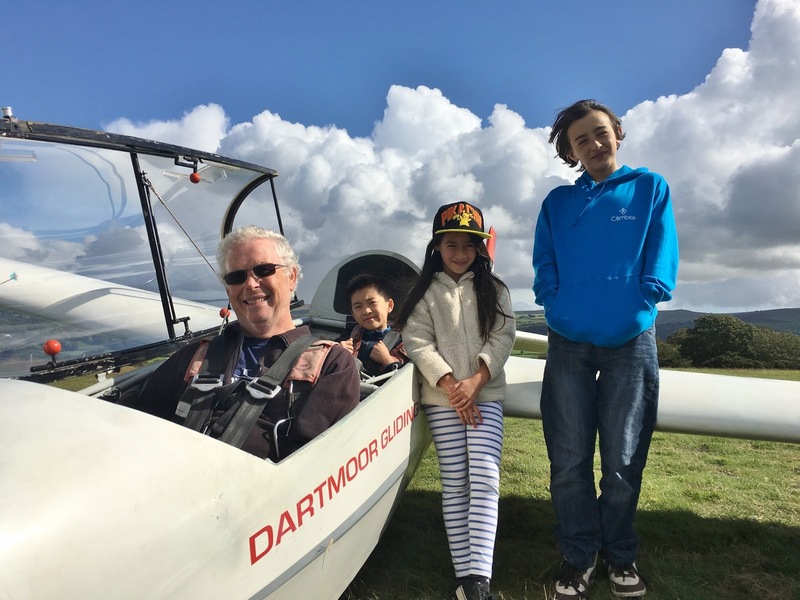 Josh Lai, Mia Burgon and Louis Costello flew with Peter Howarth today. As cloud and energy systems passed over the site it was possible to find some significant amounts of 'up', however these were difficult to centre in and hence Flight of the Day went to Bob Sansom with 17 mins (most of which were spent at or around 1,000ft agl). 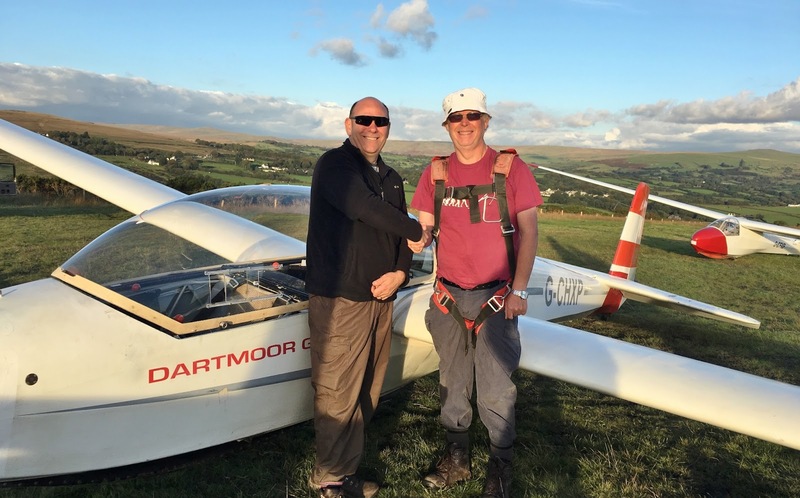 Steve Fletcher, Adrian Irwin, Ed Borlase, Jeff Cragg, Joe Nobbs and Paula Howarth also managed to find lift in patches as the sun continued to shine and wind remain within limits. 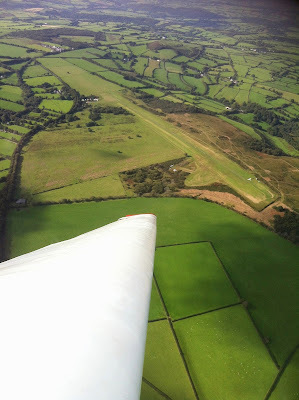 during this soaring flight just to the SE of the airfield. Ed Borlase’s view of the approach cross-field into the SW’ly wind. 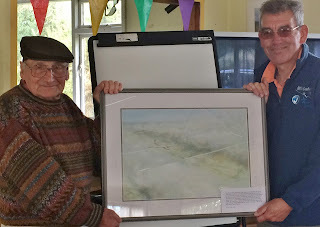 Down in the clubhouse Allan Holland arrived to present Chairman Martin Cropper with an absolutely superb pastel painting made by former member Eric Rodmell recording a flight to Okehampton and back that Eric and Allan made in wave in 1997. Eric joined the club at age 77, went solo at age 79 and will be 100 years of age next month. Happy Birthday Eric! At the end of the day we had logged 32 launches which, given that we expected to be either rained off or blown out by midday, was not at all bad.